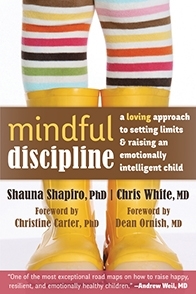 In Mindful Discipline, Shauna Shapiro and Chris White remind us that parents often fall into one of two extremes: either too permissive or too authoritarian. The permissive approach is "based on the belief that children are inherently good and do not need limits or guidance to become self-disciplined." For these parents, the word 'discipline' may have negative connotations, "particularly because it is often used synonymously with 'punishment.'" "The original meaning of discipline is 'to teach'... Most children will choose ice cream and cookies over carrots if given the chance, and only rarely do I hear about children putting themselves to bed at a decent hour in order to get enough rest for the following day. Structures such as healthy meals, regular bedtime routines, and reasonable limitations on TV and exposure to violent imagery are gifts to our children, not punishments." At the opposite extreme is the authoritarian approach, "based on the belief that children are inherently bad and that they need to be manipulated" into good behavior. The problem with this parenting style is that "too often parents say 'No!' with such force... that children come to think there is something wrong with them as a person." "The authoritarian approach can obtain short-term compliance, but does not lead to healthy, sustainable self-discipline… [when] children only follow orders from some outside authority… [they] become cut off from their own internal guidance and emotional intelligence... Approaches to discipline that rely on punishment, shame, and separation as ways to obtain compliance keep children in chronic states of stress." Instead, Shapiro and White recommend the 'authoritative' approach, which "views children as having the seeds of good behavior within them, and believes it is the parent’s responsibility to nurture and invite the 'good,' while compassionately tempering the 'bad.'" A big part of this is trying to understand what's behind whining or misbehavior, doing our best to meet children's needs without giving in to their desires. Allowing them to express their emotions "does not mean our children can do whatever they want... wanting a third cookie before bed is fine; that doesn’t mean that you can have one." As we've seen repeatedly in the recommended books and interviews with mindfulness teachers, it's the mindfulness (or lack thereof) of the adults that makes all the difference. "Children respond more to our state of consciousness than to our words. When we are present, grounded, and clear, our children listen. When we are angry or attacking, they act out more." But what if we do become angry (as we inevitably will)? Shapiro and White see this as an opportunity to model how adults can mindfully deal with our own feelings and our own 'mis-takes,' "moments or occasions when we missed the mark and need to correct course." "It is important for children to begin to see the difference between what we feel inside—how we are moved by our emotions—and what is and is not an appropriate expression of our impulses in different environments." This is an ongoing process that adults and children can work on together. "The Mindful Discipline approach offers a conscious path toward teaching our children to find their innate wisdom while simultaneously transforming our house into a more restful and harmonious home… With intentional practice, our own self-awareness, self-regulation, and self-discipline coevolve and mutually support these qualities in our children." Mindful Discipline has specific suggestions for mindfully dealing with typical parenting challenges. The authors give examples of their own mis-takes and how they dealt with them, and provide fourteen Mindful Awareness Practices, some of which are specifically designed for parents. With permission from New Harbinger Publications, next week I'll post "Wise Elder Visualization," which can help parents (or teachers) respond mindfully in emotionally-charged situations.